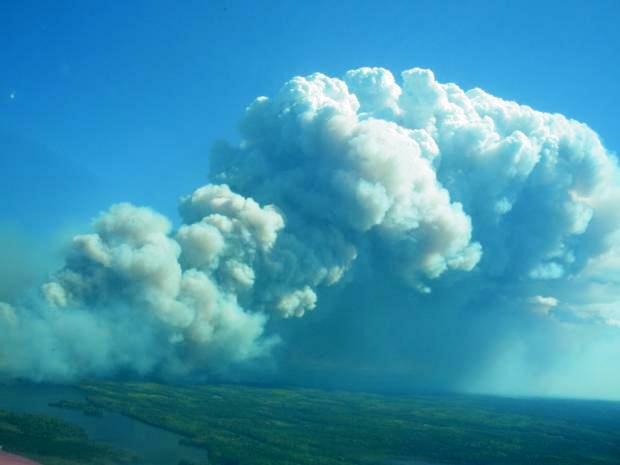 Home > About the North Woods > What Would Sig Say About the Pagami Creek Fire? I’m sure we all wonder how Sig would respond to a major event like the Pagami Creek forest fire. Back in the 1970s, Bud Heinselman was finishing up on his monumental fire history research in the BWCAW. He and Sig collaborated often then because of the upcomign 1978 legislation. Bud, undoubtedly, would not pass up an opportunity to discuss his work as well as the political questions. So, Sig was well aware of the dominant influence of fire in boreal forests. Bud’s work determined that fire would visit on the average of once in every 100 years. In 1863-64, fire covered about half of the Boundary Waters or about 500,000 acres. The Pagami Fire is a little over 90,000 acres as I write this today. Many other fires since the 1600s were larger than Pagami. One of the great tenets of the wilderness concept is that nature will be able to function as closely to a natural setting as possible. Wildfire is an unruly and unpredictable part of this equation. The esthetics of a burned forest to the untrained eye do not compare to the virgin old growth forest we often associate with wilderness. Bud Heinselman, however, taught us that the forest MUST burn in order to regenerate itself. Natural fire is a little like predation in that it is not pretty at the time, but it is necessary for a healthy system. So, I think Sig would be very comfortable with whatever outcome the Pagami fire gives us. No lives were lost, no private structures were lost, only two major canoe routes are significantly affected, the moose are especially pleased, next May the forest floor will be green again, a whole host of plant life will have a new beginning. These are all good things. We should all be thankful that Forest Service policy has room for major unpredictable events like this. A healthy vibrant ecosystem requires it.